Museums in Karnataka are the storehouse of manuscripts, sculptures, statues, art, artefacts and everything that is related to the erstwhile rulers of Karnataka. A major number of museums in Karnataka give one glimpse of the about the art from the past. Since the ancient rule, Karnataka has been an epicentre of South India's economy and culture. In the past, there was a consistent rise and fall of many rulers like Hoysalas, Chalukyas, Vijayanagara rulers and Mughal. Gallery like Archaeological Museum in Hampi, Jaganmohan Palace and Art Gallery in Mysore and Indira Gandhi Manav Sangrahalaya are home to some of the most spectacular pieces of the art. Also worth visiting is the Folklore Museum in Mysore which exhibits elements of folklore, dance, drama and music. 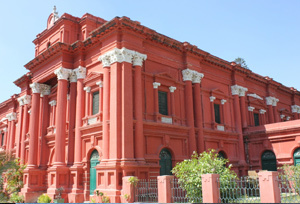 Mysore and Bangalore are two important towns in Karnataka where one can see mostly museums. Other than the art museums that speak about historical sculptures, there are some galleries which tell about science and defence development as well. Visvesvaraya Industrial and Technological Museum in Bangalore is an interactive science centre, dedicated to the different science disciplines like space gallery, science centre for kids, engine hall, etc. In short, all the museums of Karnataka portray the history, civilization, culture and heritage of Karnataka.